The endangered Pangolin is the world’s most trafficked animal. As a result, the Pangolin population continues to decline. What is the Pangolin? Why are people after it? And how can you help? From their scaly appearance, it looks like Pangolins are reptiles, however they’re actually mammals. The scales on its body are made up of keratin, and accounts for roughly 20% of its weight. They have a small head with no external ears and a long, wide tail. Pangolins also have no teeth, so, to assist with breaking down food, they have a gizzard-like stomach adapted for grinding food. In Africa, there are 4 different species; African White-Bellied Pangolin; Giant Ground Pangolin; Ground Pangolin and the Black-Bellied Pangolin. Depending on the species, pangolins range in size from 30 to 152cm. Pangolins stay in their burrows during the day and come out at night to hunt. They use their strong sense of smell to find termite and ant nests. Their claws dig the insects from mounds and their long tongue (which can be up to 41 centimetres) takes care of the rest. The pangolin’s self-defence mechanisms are one of many things that make the Pangolin so special. When threatened they roll into a ball and their scales can cut and inflict harm on anything inserted between them. They also emit a very unpleasant acid from their glands, similar to that of skunks. Why is the Pangolin the world’s most trafficked animal? Pangolin populations have been declining for decades. This is mostly due to large scale domestic and increased international trafficking for their meat and scales. 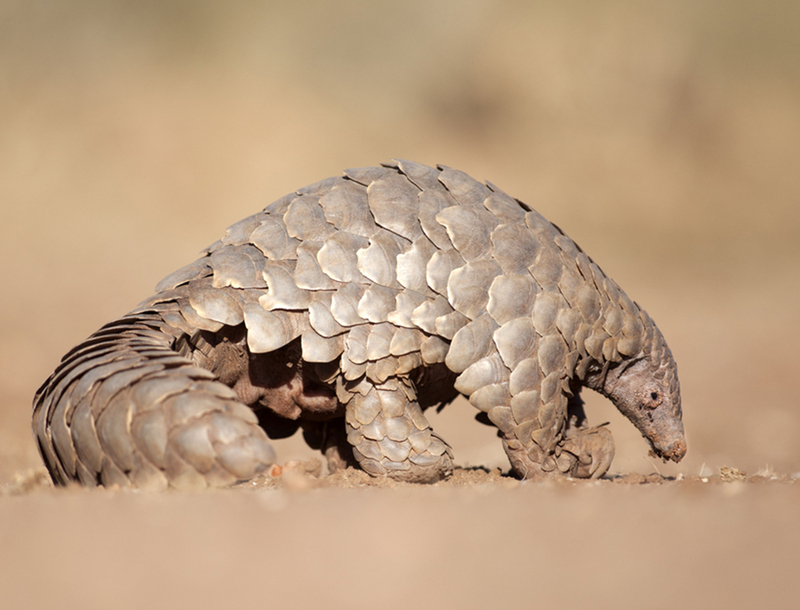 Currently, domestic trade poses the largest risk to Pangolins in Africa. All four species are broadly used in Traditional African Medicines, known locally as Muthi. The Pangolin is a source of food in Central and West Africa. Many villagers in these areas view Pangolins as just another variety of bush meat. In addition, some cultures believe that if you see a Pangolin during the day, a drought is approaching. The only way to prevent the drought is to sacrifice the Pangolin next to a river. Other cultures use Pangolin fat to ward off evil spirits. Some people still believe that carrying a Pangolin scale or a vial of blood will protect them from harm. The list of reasons people have for killing Pangolins just goes on an on. In regards to international trade, the issue is worsening. The Asian pangolin population is rapidly declining with increased trade agreements between Africa and Asia. The most used part of the Pangolin are its scales; often powdered, the scales have a reputation for curing various ailments including kidney problems and treating asthma. In addition, Pangolins are being consumed in China and Vietnam as a delicacy. Wealthy middle class businessmen display their wealth and power to impress potential clients serving Pangolin. Asia can no longer meet the high demand for Pangolins. So, the African Pangolin population is being targeted. In the near future, the illegal international trade is likely to become the most significant threat to African Pangolin species. The best way to help save the pangolin is to raise awareness. The more people that know about the issue the better, and the more likely the trafficking will decrease. You can also help by donating to organisations dedicated to conservation and protection of the pangolin such as the African Wildlife Foundation (AWF). Much needed funds will help protect the pangolin’s habitat and allow for better conservation and protection against traffickers. Your donations will help produce public awareness campaigns such as the “When the Buying Stops, the Killing Can Too” campaign. Celebrities including Jackie Chan and Richard Branson are helping to educate consumers about wildlife products. They are sharing facts about the damage caused and the lack of medicinal or magical properties in Pangolin scales. The “Canines for Conservation” program was launched to stop the distribution of Pangolin scales. Sniffer dog teams have been trained and deployed to key airports, seaports and other wildlife trafficking hubs. This program alone has been successful with numerous interceptions of pangolin scale trafficking across Africa. Furthermore, AWF works with communities living near pangolins and other wildlife to provide them with tools and strategies to engage in sustainable agriculture to deter them from hunting threatened wildlife for food. When everyone works together, we can really make a difference and ensure the long-term survival of this incredible species.